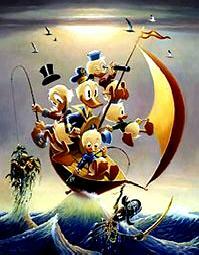 TMe: Donald Duck artist, Carl Barks, passes away. Cartoonist Carl Barks, who drew Donald Duck comic books for three decades has passed away of leukemia at his home in southern Oregon, according to Walt Disney representatives. Barks, born in Oregon in 1901, joined Walt Disney Studios' art department in 1935 and drew 35 different cartoon characters. 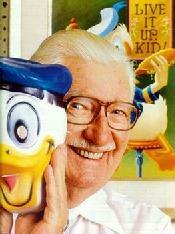 He also wrote Donald Duck comic strips at Disney until he left in 1942 to become a chicken farmer. In 1943 he began drawing and writing comic strips for Disney comics. All tolled, Barks wrote 400 scripts and drew 6000 pages, as well as, 200 covers. Barks was best known for changing Donald's character into an "everyman" instead of the noisy, quarrelsome brat of the past. He was also responsible for creating the stingy old millionaire miser, Scrooge McDuck, and the town of "Ducksburg" where Donald and his crew lived. When Barks retired in 1966, Disney had given him permission to paint their characters, but withdrew its permission when fans began to sell photos of his work for $500 apiece. For the next five years, he painted scenes of American history using duck characters while the price of his Donald Duck portraits soared. Finally, Disney relented and renewed permission for him to paint its characters and his prices reached into the six figures. Carl Barks, artist and icon. He was 99.